The molecules released through aromatherapy will stimulate and affect portions of your brain. The triggers that it provides to the brain can produce emotions, can mask other types of emotions and can calm the body to allow additional treatments to work. Most people don’t realize it, but doubt, fear and anxiety can all work against their body’s natural attempt to heal itself. These harmful emotions can block pharmaceutical cures as well. Aromatherapy acts to calm the body and allow medicine to heal. You might not accept that smelling certain fragrances can heal you, but if you are suffering from a chronic illness, can you really afford not to believe? I used to believe that aromatherapy was bunk and that any doctor that would dare to recommend it was nothing more than a quack. I have had chronic back problems for about as long as I could remember. I don’t remember a time when I wasn’t constantly being hindered by a slight pain in my lower back or the inability to rotate my body fully to either side. My back pain affected every aspect of my life. Every decision was made with regard to if my back would allow me to do it. I lived in a state of permanent threat of pain. My back was constantly on my mind and I was unable do anything to relieve it. I lived my life not knowing when it would act up and I’d have to lie on the floor for half an hour to let it subside. I refused to play sports, go swimming on the beach or even run to catch the bus for fear of my back giving out. Since the pain started, I’ve tried to find a cure. I’ve seen countless doctors, chiropractors, surgeons and back specialists. They all gave me treatment, but nothing worked. I went to physical therapy and did yoga. Nothing made the pain go away and nothing let me live my life comfortably. No one was able to relieve my pain. I was against using any Eastern types of medicine to help my back, but eventually I was left with no choice. I didn’t want to ask my doctor what alternative forms of therapy I could try. I didn’t want him to think that I no longer trusted his course of treatment. Instead, I went to my trusty laptop and started looking online for the best treatment for my condition. Again and again, the most recommended advice was to try aromatherapy. Naturally, I started reading more and more about it. The more I read, the less I believed in the course of treatment. I had a hard time understanding how smelling an oil would make my back feel better. No matter how much I researched and read about it, no one provided me with the information that I needed. No one told me the way aromatherapy worked and how I could do it myself in the comfort of my own home. Most importantly, nothing I read gave me the confidence to be sure that aromatherapy was the right path for me, so despite the recommendations I didn’t try the treatment. I continued with my back problem. After a while the chronic pain became second nature and I learnt to live with it. I lived with it until one day I was early for a meeting and found myself wandering around a mall, trying to kill some time. I wandered into a natural healing store and saw their collection of essential oils. I surprised myself when I recognized a lot of the types of oils and I surprised myself even more when I realized that I knew what conditions they were supposed to help with. Despite the amount of research I had done, this was the first time I had seen the actual oils. I saw the essential oil that was recommended for my back and I picked it up. I opened the cap and gave the bottle a sniff. I would love to say that I felt better afterwards, even though at the time I thought that was the way aromatherapy works. As more of a scientific experiment than as a treatment, I bought the essential oils and figured I’d see if they would work. At first, I didn’t notice any change. But I did enjoy the smell, so I kept the oils. They had a calming effect on my life and, for that reason, I kept smelling them. I didn’t even realize that my back was feeling better. I lived with the pain for so long that it was always just in the back of my mind, so I didn’t feel anything different when it wasn’t there. I think it was two weeks later when the thought dawned on me that my back was feeling better. I know the aromatherapy didn’t solve my problem, but I also don’t think it was pure coincidence that the treatment and the relief happened at the same time. I know now that aromatherapy is a useful tool in helping the body feel better. Western medicine has long understood the counter-effect that stress has on any type of treatment regimen. Aromatherapy is practiced using essential oils and volatile plant oils to create psychological and physical sensations. It usually requires scented compounds created through volatile plant materials, essential oils, or similar herbal products and it is used as a form of alternative medicine in conjunction with other forms of treatment for positively affecting a person’s health or mood. If you are struggling with symptoms and don’t believe in the medicinal power of aroma, then you are doing yourself and your health a disservice. People have been using aromatherapy for thousands of years to treat all types of different conditions. Are you willing to put your life at greater risk rather than try it for yourself? Unlike acupuncture, chiropractice and other forms of alternative medicine, aromatherapy doesn’t require a professional to administer the treatment. 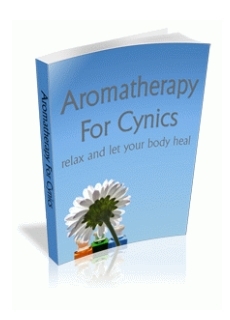 You can buy the essential oils and perform the treatment from the comfort of your own home. It is inexpensive and easy to do. It is one of the few effective remedies that you can do by yourself, without expensive doctor bills. Learn how to help your body heal itself and just make sure that you are cynical about its effectiveness, that your health doesn’t suffer.